Disclosure: This is a sponsored conversation written by me on behalf of Kohl's and Latina Bloggers Connect.All opinions, giddiness over birthday and adorable child, are all mine. It's my birthday week! Yay! But it is also Easter. I have memories of spring dresses, meals shared on Sundays and togetherness. Last week, while at a gathering with the extended family, I proposed starting Sunday dinners (and movie night). A time when we can all come together and reconnect. I don't know about you, but a lot of times I see more of my family on social media than in person. I want to change that. As I look to move into a new home, my intention for that place is to be a refuge for family and friends, a place of gathering. So I figure we might as well start now! And since it is Easter, I figure why not this weekend. Let the record show that it is also my birthday so I figure killing two birds with one stone was a good move. Thing is, I haven't really equipped the house with all of my needs in the kitchen. Which is why this project had perfect timing. Between needing to ensure I had stylish settings (I want to try and theme the dinners in the future based on the movies we will be watching) and realizing while my girl was on spring break this week that we need an overhaul of clothing thanks to the fact that she refuses to stop growing, Kohl's was the perfect stop for all things needed in the Mamihood! I found great melamine dinner plates that come in assorted colors, giving my table a pop of flare at a great price. It beats having to have settings for 20 people. I was able to buy a dozen plates in assorted colors to keep the Dominicans happy. I then added an Easter runner and a happy Easter sign that I can display anywhere in the house. Because the deals were so great and due to the fact that good smelling things call my name, I created this display on my entertainment center. Easy peasy lemon squeezy. My secret here? Using a simple serving tray to hold my candles. Keeping my child away from the kids clothing section was impossible. And so not only did she score an Easter dress but, the Frog Princess picked up the outfit she'd be wearing to go to the parks today as well as her Easter home outfit which she will change into after church. My kitchen is ready to roll and so is my child. I no longer have to depend on my one rinky dink cookie cutter to handle all things in the oven thanks to these great Food Network baking sheets. I think I'm ready for Sunday dinners, y'all. She was slightly miffed that the video was so short because she had a lot to say about all the clothes! I'm afraid I might have to go back with a professional crew to get her entire spiel. I had such a great time shopping with her. I'm looking forward to spending my spring en familia and looking to extend that throughout the year. Are you ready for Easter? Are you ready for spring? Are you headed to Kohl's to get it together like I did? This is a sponsored conversation written by me on behalf of Kohl's and Latina Bloggers Connect. The opinions and text are all mine. 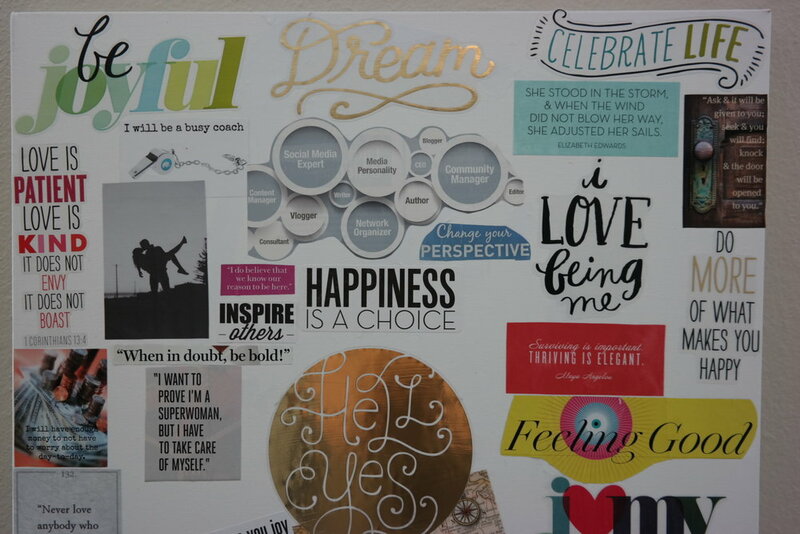 There's been a lot of buzzing about vision boards lately. 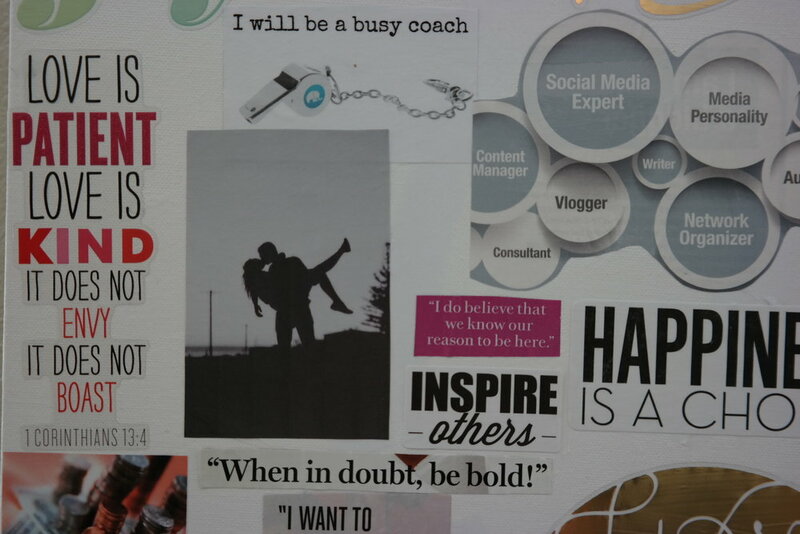 Especially when I scoped about my canvas vision boards. Here's the scope where I discussed how to get these done. I'm working on a new one and hope to share it with you soon. In the meantime, if you have a board, I want to see it! Share the image and tag me (I'm @MyMamihood on all social channels). For more details and pics on my boards, check out this post! Disclosure: this is a sponsored post. All thoughts, opinions and good smelling bath stuff are purely my own. When I bought my first house, I was ecstatic. I was even more elated when I had my first round of guests come through. One of the things that I really liked about my little doll house was that the guest bathroom had a lot of counter space. I used that space creatively to welcome my guest. Rolled up, color coordinated towels were always the rage. I also decided I wanted my guests to feel pampered so I would create these guest baskets. There, they would find soaps, body wash, lotions, loofahs, you name it. This was a hit! Everyone said they felt like they were at a hotel. Of course, they were able to take all these goodies home with them at the end of their stay. This past holiday season, I created several baskets of treats for my family. The first basket was my sock basket. When you come to my house, you will be greeted by an array of soft socks that you can change into as I like shoes to be left at the front. With my sister staying with me for well over a week, I wanted to make sure that she and her partner felt welcome. So they got a special treat. A caring basket featuring Caress. Y’all, can I just tell you that I have found my favorite bath bar in the world! This bar had my entire bathroom smelling of flowery scents that took me back to some island paradise. My sister loved it and I happily stocked up on it after a quick shopping trip to Sam’s. Loofahs, face scrubbies and body washes could be found in my little welcome tin. I usually put some washcloths on the bottom to make my tin look nice and pretty. At the end of her stay, my guests get to pack up all the good smelling yummies. I like to think that when they get home and use the products, they get to think about me and their stay at Chateu Mami. Oh and if you don’t have guests, this makes a great little gift basket as well. Wrap it in some cellophane and voila! I’ve been known to bring this little gift when I’m staying at someone’s house. It can sometimes take the pressure off from a host. Do you create easy to gift baskets for loved ones? Seriously, you guys need to try this bath bar. It I everrathang! You will not be disappointed. Trust me, I’m a Mami. Disclosure: This is a sponsored post. All thoughts, opinions and personal pride in finally getting vacation pictures together in a beautiful photo book are purely my own. We went on vacation in August. I just completed a post telling y'all about it. Imagine what happened to the pictures?! Nothing! Has that ever happened to you? I have a million pictures and nowhere are they displayed except in the privacy of my own screen. I'm happy to report that this stops NOW! There are times when I take on a campaign and then there are times when a campaign takes me on. This has been Shutterfly for me. 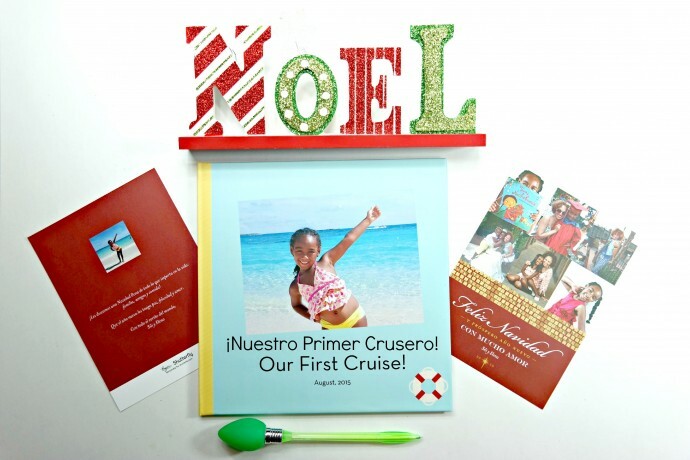 First, the stunning and beautifully done on-time holiday cards en español and now, I get to gift my Frog Princess with a photo book detailing our amazing crusero! As with the tarjetas, the photo book was super easy to create. I am an avid fan of ThisLife which is part of Shutterfly and it means that I can select my photos right from the app. Even if you don't have ThisLife, though. It's such a simple upload for photos. And then magic happens! If you're not creative or lacking in time (errr, for those last minute gifts, folks) you can let Shutterfly lay out the pictures. I find this is not only super cool but take the burden of where to begin placing photos in your photo book. I went back and made some layout changes and background changes. It doesn't get better than this! I love the personalized gift that keeps on giving. Shutterfly offers an easy, creative and convenient way to share family milestones. Cruises, birthdays, Thanksgiving. It's easy peasy lemon squeezy! 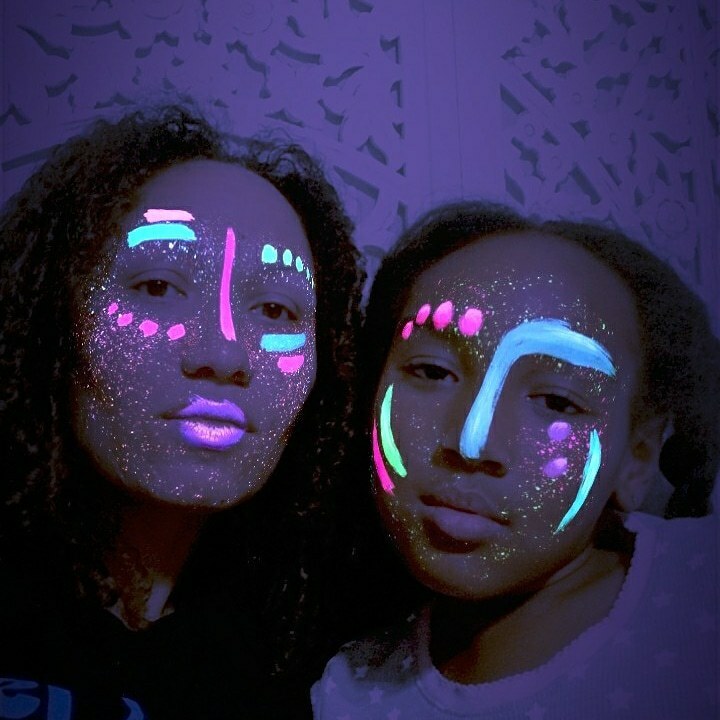 You can be the supah-star of the family and make your annoying cousin who is always trying to one-up you look bad (not that I have this problem, mind you). Now, its even easier to share these creations with your abuelita, mother, neighbor, tía and other loved ones with Shutterfly’s new Spanish applications. Oh and with Spanish language customization, and a Spanish-language customer service, I can even share this with tía and she can do it on her own (without calling me 13 times!). I'm over the moon at how this book came out and cannot wait to see the look on my girl's face when she opens this gift on Christmas morning! As the person in charge of all of the photographs that my mother kept, I think it's so important to highlight all things family and together. I feel that photo books like this one will be treasured for years to come. It's more than an album, it's all about the stories that you can write beyond the photograph. And to me, that makes it even more special. What treasures will you create? Disclosure: This is a sponsored post. All thoughts and tears over not yet having this kitchen are purely my own. I'm currently house hunting. It's going to be the house where I hope to put notches in the frames as my child grows. I haven't owned a home since the month I gave birth and I am anxious to make a space my own. Any home that I buy has to have an amazing kitchen. When I saw this kitchen at Type A Parent I secretly hoped someone would surprise me with it. You guise! It was perfection!!!!! The LG Studio Line at Best Buy made my heart skip several beats. And if you're looking for appliances as you make your way to the holidays, you do too! Get to it! If you head on over to Best Buy, you can save an additional $400 when you create your own 4 piece LG Kitchen Package. But hurry! You only have a couple more days. What appliances would you get from this collection? Side note: yeah I have a gadget to make cake pops! The bio does not lie, people! I love that it comes in a nice compact kit. This kit brought dark blue ribbon and beige ribbon though you can stock it with all kinds of colors! Gold, black, red, pink, blue...you get the drift. If you haven't yet purchased anything for mom and mom happens to be a crafting genius, then this is a nifty addition to her repertoire. If you're the mom and no one gets you what you want, use those gift cards to getchu some of this! And then make me a gift and wrap it in a pretty ribbon. Okay and get this, if you get this for your mom, you should totally print a ribbon with a cool message and then wrap the kit in it! First she'll be all "ohemgee! Look at this personalized ribbon!" and then when she opens it she'll be all "holy crap I can make my own ribbons, get out so I can play!". I'm paraphrasing here but you get it, right? I've already had a few of you hit me up on Instagram so I can tell you where to get the goods. I think the general consensus has been I NEED IT! And I couldn't agree more. But the thing I'm excited about? I think I'm going to make bookmarks with this! Endless possibilities, people. Endless, I say! So, are you crafty? Is this cool or what? Sound off, beautiful people! Disclosure: I was provided with a Ribbon Kit in order to facilitate the review. All opinions are my own. Also, the link above is my affiliate link. Disclosure: This is shop has been compensated by #CollectiveBias . All thoughts, opinions and barking are purely my own. Any crafts that include the use of thumbs are all Mami & the Frog Princess. It's taken me long enough to get on here but as soon as Mami mentioned my Purina® Pro Plan®, I had to jump in and volunteer to finally contribute a post! I know a thing or two about good nutrition and great taste. Seeing as the only food that doesn't mess with my tummy is Purina® Pro Plan®, I can tell you I'm a bit of an expert in this category. What can I say? I'm a #ProPlanPet . Another thing I'm an expert in? My family. Mami, the Frog Princess and I are thick as thieves. They keep me on my toes during the week but on weekends, it's our time to bond. Now that it's no longer freezing in Florida, I'm all about the all-important car ride! Of course, this weekend we headed to like the only store that I can shop at these days. 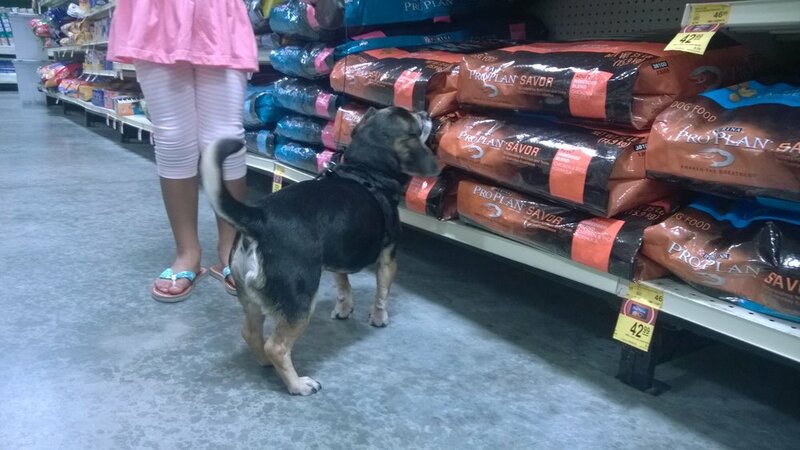 I love PetSmart for a lot of different reasons but mainly because I can stroll down the aisle in peace as I search for the next good bag of Purina® Pro Plan®. It's not easy to pick one, by the way. So many options! I was anxious to get back home because Mami was talking about doing crafts and apparently, it was finally time to get me involved. Yahtzee! Mami's always talking about how we're growing and how she wants to keep us little. But she can't! We are both healthy and strong. The girl gets her fruits and veggies and I get real chicken, beef, lamb, or salmon because it's the #1 ingredient found in all Purina® Pro Plan® dry formulas. I normally eat the salmon but this time around, I barked at the Savor® Adult shredded blend chicken and rice. Can you say yum? I remember a time before we found Purina® Pro Plan®. They were sad times with lots of tummy problems and skin issues. I'm so glad those times are behind me! After getting a big bowl of awesome, Mami got to work! She's been wanting to do some paw and hand prints and we're finally getting around to it! I'm extra psyched that my man NoNo is here with us too. We are known around these parts as the three amigos! Here's how we created a Best Friends Keepsake for our wall. Select your craft area. We use a picnic mat to do our handy work. Are you on Instagram? Follow me there. Oh and I have a Twitter account too! It was great finally being a part of the 'hood. Do you have a dog? If you'd like to try Purina® Pro Plan® free, find a rebate here! We've shared our latest craft now it's your turn? Do you craft with the dog in your life? The other day I got a text from my girl, Chandra. We were talking vision boards when she sent me an image of one on canvas. I hadn't seen that before! 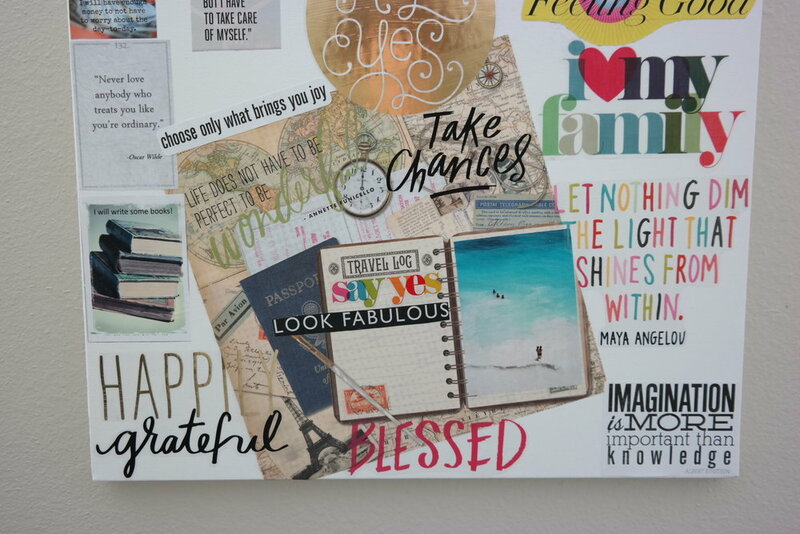 I was in the process of creating "art" for my room and thought "why not a vision board?". I've had a hard time finding exactly what I wanted for my room and this proved to be the perfect thing. I'm a fan of crafty things and of course, firmly believe that you should take an idea and do with it whatever you'd like. So this isn't necessarily a "how to" but more of a "do you" post. I went to Michael's where I found canvas on sale (woohoo!). I then had a crazy idea that maybe I could use scrapbook paper to give the board some depths. 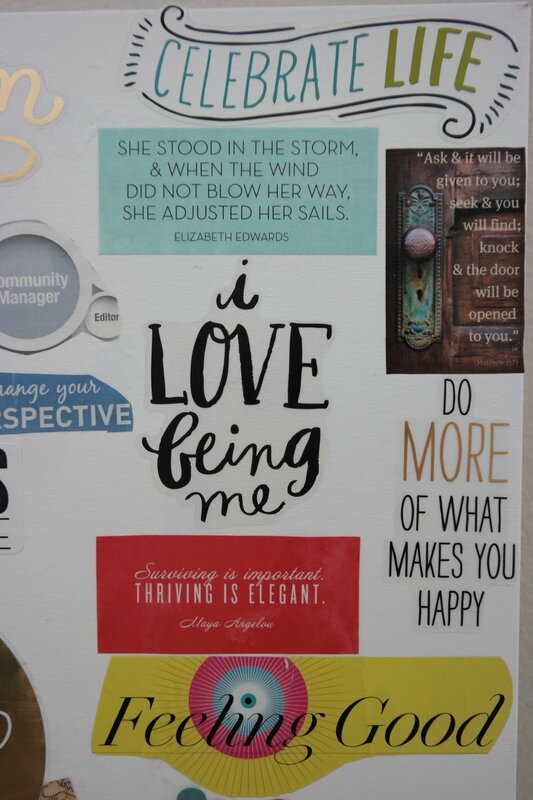 I also got lucky in the scrapbook section and found big stickers with wonderful phrases that resonated with me. The key ingredient here is the Modge Podge. Don't know what it is? It's magic, that's what! I used Modge Podge and canvas when I did pictures of my mom that hang beautifully in my home and of course, I've been a fan ever since. First, I set about figuring out which phrases I liked and then started laying them out on the board as I felt they fit. I shifted things around as needed and once I found a place, I pulled out the Modge Podge, slathered it on (carefully) and then pressed down on the canvas. You have to be careful with paper because I had one piece of scrapbook paper that did not make it (I might've gotten generous with the podging). I then added the stickers where appropriate (some I had to brush Modge Podge on so they could stick). Once all images were set where I wanted them, I applied Modge Podge to the entire canvas. When wet, you'll think you ruined everything because it will be hazy white. But Modge Podge actually dries clear. This will give your canvas a "ohmaigaah, she actually just painted this!!!!" feel. But we all know better. I don't know if I have a favorite. I love all the words and the few images I used. I got board happy and actually created three boards and some smaller ones that I painted prior to adding the stickers to give the wall depth and pull in the colors from my bed onto the wall. I'm BEYOND ecstatic and can't wait to do more of these. The best part? 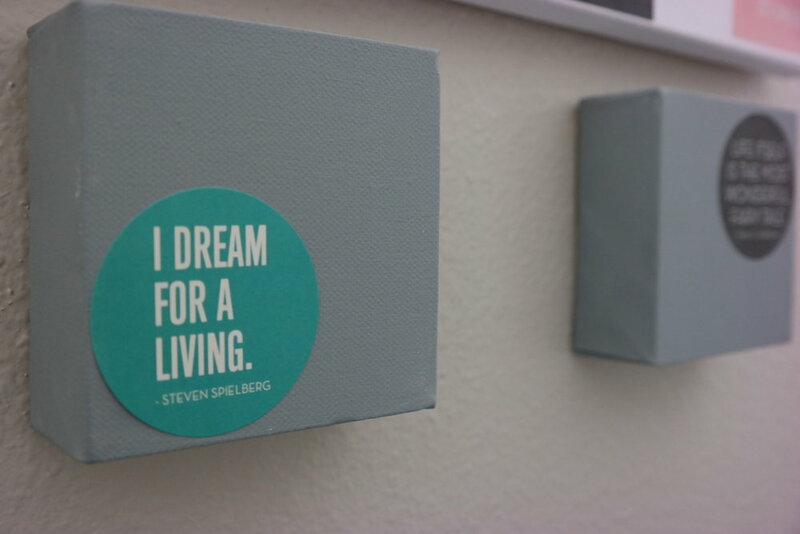 My vision boards are no longer relegated to the back of my desk or a corner of the room. They are featured prominently and double as a beautiful work of art. What do you think? This post is sponsored by awesome friendships. Can I introduce you to my girl Suzy? I've been stalking her site for while and I can't tell you how proud I am to know her. Suzy is my friend and homegirl. I love her to pieces. I actually knew her husband, Andree, first (awesome photographer, btw). I met Suzy and we have gotten along from day one. When I heard that they were combining their DNA to add on to their family, I may have jumped up for joy. Since having her newest bundle of joy, Suzy has decided to stay home. But, she is not content with sitting around and eating bonbons all day (because, that's what we do y'all!). No way. She has decided to take the leap into her heart's content. And you know I'm a fan of following dreams. She created Suzy Sew Crafty. Suzy is a sewist, embroiderer, crafter, blogger, wife and mom of three, (12, 10 and 1). What I didn't know was that she always loved sewing and crafts. Though I kinda suspected the craft thing as she showed up at my house when I was on bed rest with all kinds of goodies for a vision board. I will be forever grateful for that day. I think she was one of two visitors that came to see me during that time. We vision boarded and stuffed our faces with yummy Publix subs (I might not remember what I did 2 hours ago but I surely do remember that I ate a chicken tenders sub about this same time 5 years ago). As an aside, Suzy is also the person responsible for me getting a blog up in the first place. She introduced me to WordPress and sat up late looking at templates for me before I knew what the hell I was doing. I am super excited that I get to bring some of her pieces into my home. And I'm giving her all kinds of ideas. But the ideas are all for me so don't ask her what ideas I had. Come up with your own! Or check out her gallery. It's outstanding. Here are some things that caught my eye. I'm digging the idea of awesomeness for the holidays. And...I'm thinking of the great gifts I she can create. I might pass them off as my own, I haven't decided how to work all that out yet. In the meantime though, you should totally check out her site and her work. If you want to be friends with her, you can't be find her on Facebook, Pinterest, Twitter and Instagram. Stop by her site and see if anything tickles your fancy. Then buy it for me. Thanks!